Our next 200hr program starts March 2019 with Kenny Graham, Mandy Bolder and Dieuwertje Homan. We teach an active form of alignment based hatha yoga and our aim for you is to learn teach a yoga class efficiently and safely. We will dive deeply in the how and why of the poses and as anatomy is an important part of our training you will learn about the bones and the main muscles of the body used in yoga. Meditation and pranayama are practiced on a regular basis during the training. Other topics in the training are: philosophy, chakras, mudras, mantras, yoga and pregnancy and history of yoga. The Teacher Training program includes 8 weekends: Saturdays and Sundays from 12:00pm-7:00pm by Dieuwertje and Mandy. 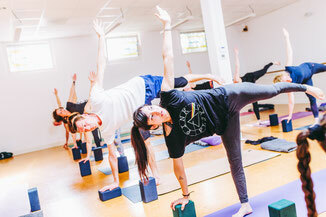 Once you have completed our teacher training you can register at Yoga Alliance with your certificate. We also offer continuing education 300RYT, click here for info.